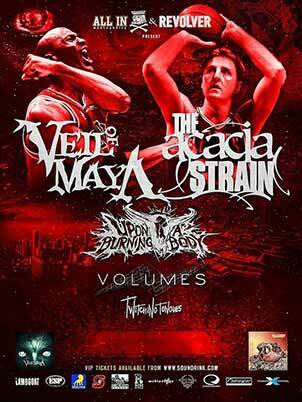 Veil Of Maya, The Acacia Strain.Upon A Burning Body, Volumes. Upon a Burning Body ~ "Sin City/Game Over"
Veil of Maya ~ "Interview with Brandon"
Veil Of Maya and The Acacia Strain on day two of a co-headlining run with Upon A Burning Body, Volumes, and Twitching Tongues. The tour began with the 6th annual California MetalFest in San Bernardino on November 24th and finished up in St. Paul Minnesota on December 16th.